Now his brothers went to pasture their father’s flock near Shechem. And Israel said to Joseph, “Are not your brothers pasturing the flock at Shechem? Come, I will send you to them.” So Joseph went after his brothers, and found them at Dothan. And Reuben said to them, “Shed no blood; cast him into this pit here in the wilderness, but lay no hand upon him” - that he might rescue him out of their hand, to restore him to his father. Then Judah said to his brothers, “What profit is it if we slay our brother and conceal his blood? Come, let us sell him to the Ish’maelites, and let not our hand be upon him, for he is our brother, our own flesh.” And his brothers heeded him. Jesus said to the chief priests and the elders of the people, “Hear another parable. There was a householder who planted a vineyard, and set a hedge around it, and dug a wine press in it, and built a tower, and let it out to tenants, and went into another country. “When the season of fruit drew near, he sent his servants to the tenants, to get his fruit; and the tenants took his servants and beat one, killed another, and stoned another. “Again he sent other servants, more than the first; and they did the same to them. But when the tenants saw the son, they said to themselves, `This is the heir; come, let us kill him and have his inheritance.’ And they took him and cast him out of the vineyard, and killed him. Jesus said to them, “Have you never read in the scriptures: `The very stone which the builders rejected has become the head of the corner; this was the Lord’s doing, and it is marvelous in our eyes’? Dictionary definition: Still, ad. 1. remaining in place or at rest; motionless; stationary; to stand still. 2. free from sound or noise, as a place, persons, etc. : silent: to keep still about a matter 3. subdued or low in sound; hushed: a still small voice. 4. free from turbulence or commotion; peaceful; tranquil; calm; the still air. Stillness is meant to be practiced as a spiritual discipline. It counts for something! Non-urban life has stillness built in (hunting or fishing for example), but stillness is missing from most of our modern existence-unless we make a point to practice it. Anthony Bloom, an Orthodox writer, says the kind of stillness to aim for is the stillness you adopt when you’re out in the woods bird-watching. Quiet and still even down to your fingers and breathing. But also alert. At any moment that bird may light on a branch near you. The practiced bird-watcher learns to love the stillness as well as the bird. Bloom was a physician and a leader in the French Resistance during World War II-a real activist, who understood the power of stillness. seek thee, and find thee. Help it to turn to thee, and reach thee. Let its every thought and word be centred on thee. to the very end. Amen. 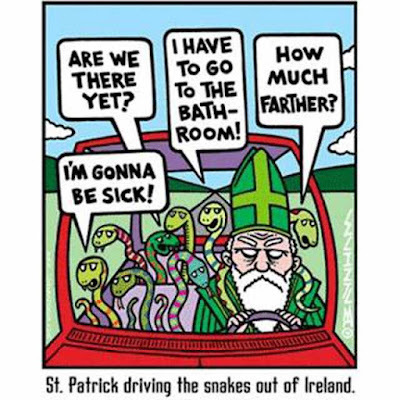 Of course, in many places 17th March is the great festival of St Patrick's Day, especially in Ireland, and where the Irish settled in the New World. Go HERE to read St Patrick's story in his own words. "Growing up in Australia as the son of a Basque woman who was born in China with bit of English and Italian and Romanian in her, and the son of an Aussie from more English and Scottish background than Irish, I didn’t learn all the Irish songs and customs common amongst Irish-Australian Catholics. 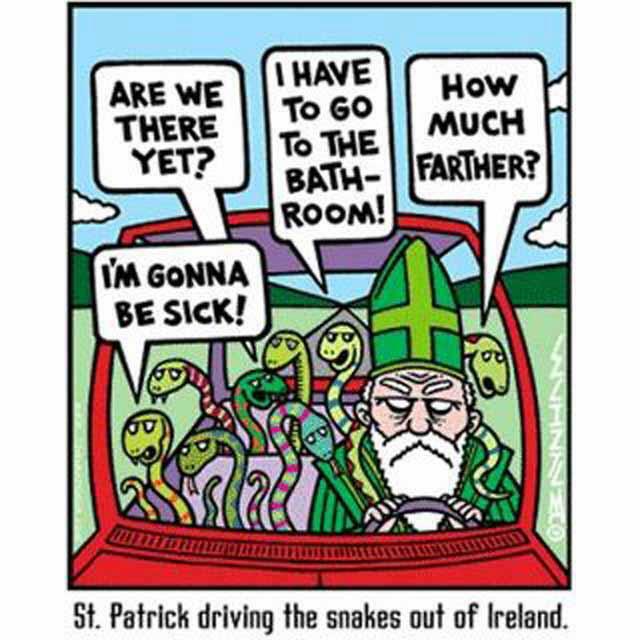 My mother did, however, learn on arrival in Australia that the heavy fast of Lent had to be broken on St Pat’s day and so St Pat for us meant chocolate more than Guinness and shamrocks! "St Patrick, as we all know, travelled ceaselessly up and down Ireland preaching the Gospel, such that by 461 he had completed - almost single-handedly - the conversion of the whole nation. He inspired many of the Irish themselves to become missionaries in faraway lands, including Australia. While in many ways our culture lives on its Christian heritage without knowing it, many people live from day to day as practical agnostics or indeed atheists. We need a few more Patricks of our time - men and women of passion and zeal - to bring the Gospel across our lands once again!"